Frontline Plus, K9 Advantix and Advantage… Which Is The Best Flea & Tick Preventative? Wondering about the differences between all of the flea & tick preventatives that are available these days? Offers the long-lasting, most complete flea and tick control available, killing 100% of fleas on your pet within 12 hours and 100% of ticks on your pet within 48 hours. Best of all, research confirms that Frontline works for an entire month to help keep your pet flea-free. 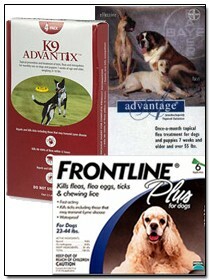 I used Frontline Plus on my dogs for years… until my vet made the decision to switch to K9 Advantix. We never saw a flea or a tick on our dogs the entire time we were using Frontline Plus. For the topical prevention and treatment of fleas, mosquitoes and ticks including deer ticks (the major carrier of Lyme disease), American dog ticks, Brown dog ticks and lone star ticks. K9 Advantix kills and repels fleas, ticks and mosquitoes. What makes K9 Advantix so different is it has permethrin in it. Permethrin will kill and repel just about anything. (It’s the same chemical they use to fog dog kennels and horse barns to kill fleas, ticks, flies and practically everything else.) However, we live in an area where ticks are problem, and our dogs have actually had a couple of ticks (either attached or embedded under their skin) while on this product. It does appear that the ticks were shriveled up and dead by the time we spotted them. Stops fleas from biting in three to five minutes, and starts killing fleas withing an hour. Within 12 hours of initial application, 98-100% of all existing fleas on pets are dead. I used Advantage on my dogs for a short time, but it didn’t make sense not to protect them against ticks and mosquitoes as well, so I switched to K9 Advantix instead. If money is an issue, and/or you’ve only got a really bad flea problem that you’re trying to combat fast, then you might want to try Advantage first. I think we’re going to go back to Frontline Plus. While I like that K9 Advantix also repels fleas and (especially) ticks… I don’t think it repels them a full 30 days. Frontline Plus seemed to be more effective on my dogs during the entire 30-day period. And since we use Heartgard (to prevent heartworms from mosquito bites), we don’t actually need the mosquito preventative that Advantix has. I’ll post an update if we notice any other differences. Another great product worth considering if you have a flea problem is Frontline Spray. It comes highly recommended by a veterinarian that I listen to on weekend radio. According to veterinarian Carey Carver who appears regularly on Pet Talk with Harrison Forbes, (on on 99.7 WTN), Frontline Spray can be used by itself weekly or even daily, if necessary. Or, you could also use with any of the other preventative measures, including the Advantix collar (which only works for ticks, but it works well). Veterinarians often use it to treat a flea problem on-the-spot in the vet’s office. No Fleas?… Reasons To Still Use A Preventative! We’ve been very fortunate. We have never had a problem with fleas on any of our dogs. Each year our vet verifies this for us: STILL NO FLEAS! 2. To keep ticks off the dogs in the summer months (…because we live in an area where ticks are quite prevalent). A veterinarian’s take on heartworm preventatives: Part I and Part II. Some tips on how to apply a flea & tick preventative. See which are the safest ingredients to look for in flea & tick meds for your dog.